Interesting. This is exactly what I was planning on saying in my post, however I decided against it. I’m interested to read more of your posts. Teacher, can we take the test next Wednesday? I haven’t had enough time to study. This was my first reaction as well. Why can’t he continue to run commercials and ads? Because it looks better this way. He’s willing to serve “something greater than his own self interest”. Maybe so…. but then again, maybe not. On the other hand, I can’t help but wonder why on earth Obama would stop campaigning now. He hasn’t been to work in two years! Thanks for the comment — feel free to read some of my other posts! Thanks for the comments, i agree with you fully. You seem to be fond of McCain’s press manipulation. I don’t think he’s as clever as you do. I think that he’s desperate, and that’s why he’s ranged all over the map this week – he doesn’t know what he should do, and he’s getting beaten up about it. 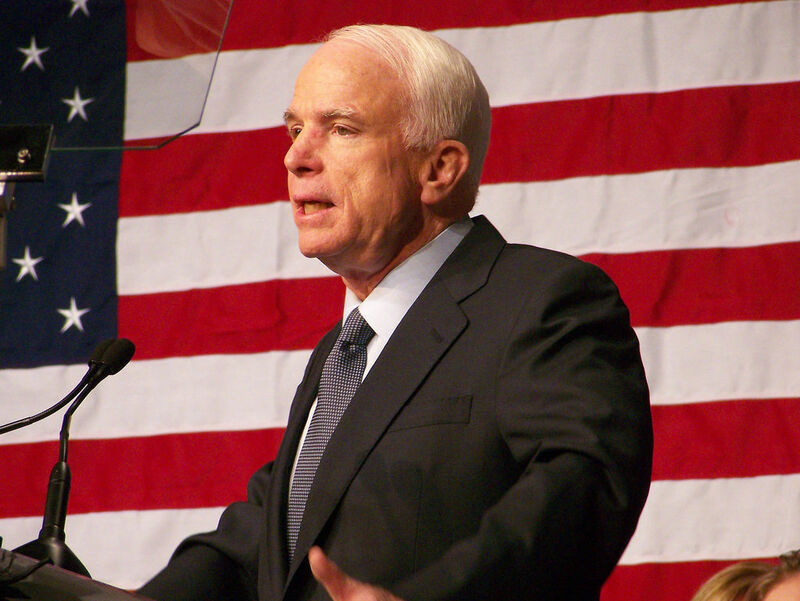 McCain stated that he doesn’t know much about the economy, only “that the fundamentals are strong.” He has missed over four hundred and fifty votes in the Senate since he began his campaign last year, even though he wrapped up the nomination in March, where Senator Obama has missed three hundred and one. As a pr stunt, his “suspension” of his campaign, which doesn’t mean anything because he’s still traveling to the White House tomorrow as the Republican nominee for president, is laughable because there’s no way for him to actually do that. It sounds good until you stop to think about what he’s saying – nothing. Senator Obama’s response that “presidents need to be able to do more than one thing at a time” is correct. While he’s been campaigning, he’s been in contact with the congressional leadership, Paulson and Bernanke (sp? ), working the phones to get the job done. The debate is a perfect opportunity for the candidates to show the American people what they’re made of, especially because there is a crisis. If you give McCain more credit than he deserves on this one, then you’re accomplishing what he set out to do – forgetting that he doesn’t know what he’s doing and patting him on the back for doing nothing. Ah, but as we seen the general (Obama) was not playing the game as McCain had desperately hoped. Now McCain is stuck in the position of looking stupid. Once again McCain underestimated the American people. No one wanted to hear about canceling the debate (by 86%). McCain should be thread carefully from here on out, since he made even more of us weary and cynical about his every move. Score Obama = 10 and McCain = 0. I think that McCain is desperate too, but I also think that this move was a good one from the strategic standpoint. It obviously wasn’t his idea, but I think it poses a trap and that’s why I wrote about it. As far as your other stuff, my post was non-partisan so I couldn’t say what I thought, rather what is happening. I personally believe that what Obama is saying is completely correct. I think that McCain will go to the white house as John McCain the candidate rather than a senator, and what Obama said is totally correct. I just think that if Obama goes any closer to an attack, McCain could send out a statement like I thought up. He isn’t as smart as Obama, but that has nothing to do with the post. I agree with you. Obama isn’t playing McCain’s game and I don’t think he will, because he probably understands it. And if Obama continues what he is doing, he’ll just make McCain look stupid, as you said. But if Obama does dig in with an attack, the post is about what might happen. I personally have doubt that he would engage in one, but that’s my opinion outside of a non-partisan post. I think what is so befuddling about this to most people still on the logic train, so roughly the 70%-80% that say to the debate…’bring it on’ (to use my FORMER main man’s euphemism)…is that it reveals the ideological fantasy at the heart of far right conservative ideology… Democracy and America gets done right when everything works smoothly, without all that fussy “politics”, i.e. discussion, deliberation, you know the things great Republicans like Abraham Lincoln were masters at. “Bipartisan” or “reaching across the lines” in Neo-Con speak is really another way of saying “you are either with us or against us”. It is the dream people lived the first year or so after 9/11, the sublime suspension of politics, when difference disappears only because a situation arises where we become blind to it. It is the dream of a politics of no parties because the two parties have become One party. It is an unlivable and, as One party systems in history show, an impossible dream. People know that know, and people are smart enough to figure out that four planes falling unexpected from the sky into our towers of Babel is NOT the same kind of event as an overproduction of homes and bad credit. But if we want to make that comparison it certainly begs the question now of which politicians have been misleading me and my fellow conservatives, yeah, I’m conservative, all along. Right now, McCain has two jobs. And he was ELECTED to BOTH of them: 1) a Senator 2) a Presidential candidate. As a Senator he has specific duties assigned to him, i.e. specific committees he sits on which focus on specific policy areas. Actually drafting this legislation is NOT his job. His job as presidential candidate, which he officially accepted at the RNC, actually is a strange job because in it he is actually applying for an even MORE IMPORTANT and MORE DEMANDING job than a 1 in 100 Senator–the one and only President of the United States. In an age of cell phones, blackberries, internet, and with legion of staff, not to mention a “tough” Vice Presidential running mate (remember her?) not only does McCain not need to be in Washington to be involved, he has a responsibility as an employee of a major political party of the American people to present his politics. Why couldn’t he have suggested to hold the VP debate early? Or why doesn’t he send Palin out to shoulder the campaign in his stead? For 8 years now we’ve had a government which has talked at us not to us, told us everything we wanted to hear but without the sincerity it takes to truly care about the bonds of our words, and substituted the image of plenty, determination, and success for a reality of adversity, ideologues, and problems…lots and lots of problems. They said, ’small government’, and we get a multi-nationals, hyper-deregulation, loss of domestic jobs, and a police state apparatus. They said, and still say, ‘we’re for the common man’, while pocketing millions from OUR labor. It’s time for solidarity. It’s time to say no to cynical politics of the neo-liberal/neo-con affluent elites regardless our stand at this point on moral issues. I’m pro life. I’ve been pro life all my life. And although it almost sickens me to do it this election, these crooks simply need to go. They NEED to GO!! As far as the first part, I really don’t understand where on this blog I stated that 9/11 caused the economy to collapse. I do think that we need a new leader, but calling them “crooks” isn’t going to get us anywhere.I agree with the fact that McCain shouldn’t be holding back. I think Obama should win. Really. Seriously. I’m not kidding here. Palin and McCain shall not win. Especially not Palin. Keep up the good work, Hen. Good post, but I think Obama’s not taking the bait. Want to crosslink?